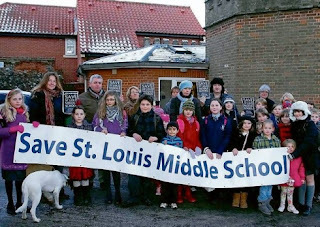 Suffolk County Council's proposals to discontinue St Louis Catholic Middle School in Bury St Edmunds have been overturned by the schools adjudicator. In a detailed determination the adjudicator criticises Suffolk County Council's lack of consultation and decision making process. The report is particularly critical of Suffolk County Council's failure to engage in an effective consultation. Something we have seen time and time again, for example in the flawed library consultation. There were many thoughtful, analytical and well argued responses to the consultation, but I have not been given any evidence of attempts by the proposer to engage with these or consider modifying the proposal in any way. Once the alternative all-through model proposed by the objector had been rejected by the Diocese, the proposer gave it no further consideration. In response to a question at the Cabinet meeting that considered the proposal, the response was; “Had Cabinet been asked to consider a proposal to create a single school from all three, it would have considered that proposal on its merits. I am aware that the Diocese and all the schools in the pyramid considered the option of an all-through school, but did not decide to promote it.” Where is the space for parent and pupil voice in this closed circle of decision making ? Ultimately schools exist to serve parents and children. National policy aspires to support a system shaped by parents. This consultation process did not reflect that aspiration. I would like here to quote the words of one parent who wrote to me; “I understand fully and accept that I do not necessarily have to like the decision that is finally made. I do however want to be convinced that it is the right decision, arrived at on a sound basis. Currently, I am not convinced that this is the case”. Convincing this parent and others is now a necessary part of the solution. This to be gets to the nub of the problem that Suffolk County Council has with decision making. It does not follow a process that makes anyone feel that a sound decision has been made. Decisions are imposed, questions not answered in any meaningful way. Alternatives not considered properly. In this case the school's adjudicator concludes that the wrong decision was made on St Louis Middle Schools future as a consequence. The decision has now been overturned and the school will remain open. I wish I could say that I think the County Council will learn a lesson from this but sadly I do not. They clearly have not changed one bit from the way they dealt with the library consultation. Carrying out a consultation should mean a willingness to at least consider changing aspects of the proposal but the County Council only seem to do this when forced.